Oni Press is celebrating Rick and Morty's 50th issue in style, and now we can exclusively reveal two new connecting covers from the extravaganza. 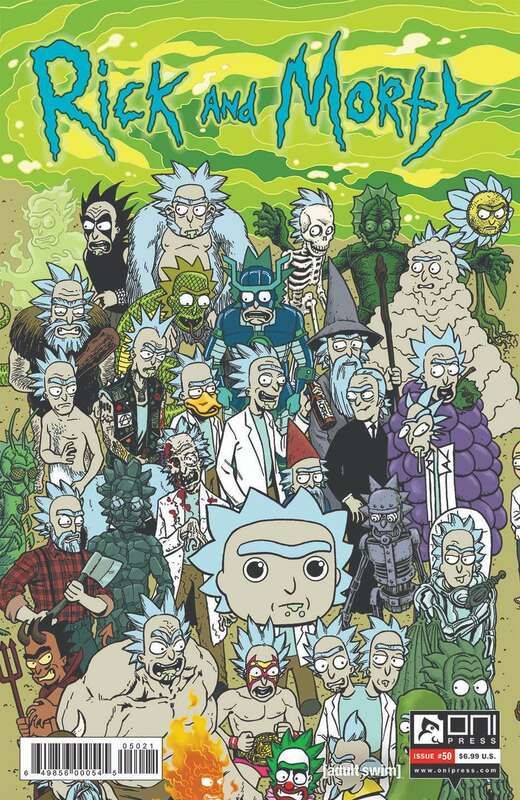 Oni Press had artist Matt Horak (Spider-Man, Deadpool, Punisher) put together some connecting covers for the big issue, which celebrates the first 49 issues of the series by featuring Rick and Morty in a number of creative versions, and you can check out the awesome new covers below. In the cover, there's got apes, giant grapes (hey, that rhymed! ), sunflowers, lizard men, cavemen, punk rockers, .lumberjacks, aliens, toys, robots, spacemen, wizards, skeletons, zombies, strongmen, devils, wrestlers, twins, clowns, men made out of fire, insects, bananas, super villains, Frankenstein's monsters, creepy people, duck faces, sumo wrestlers, soldiers, vampires, surfers, ghosts, barbarians, wolf people, and, of course, Pickle Rick. "It's just Rick and Morty. 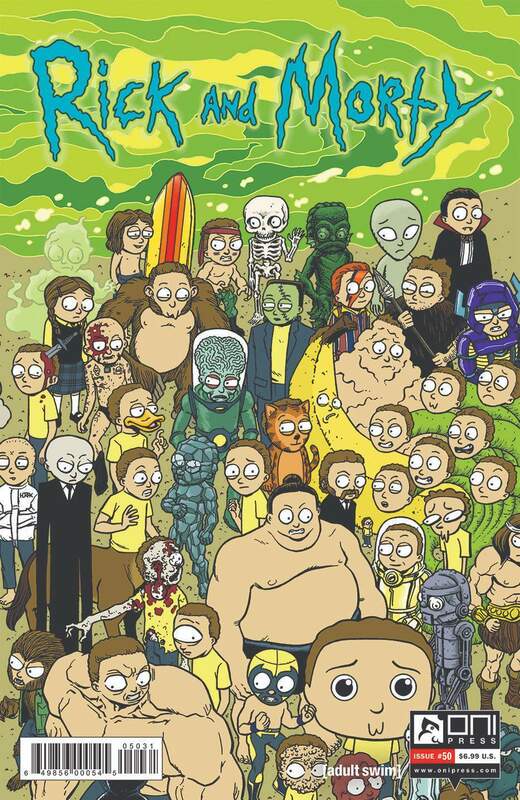 Rick and Morty and their adventures, Morty... Rick and Morty, forever and forever, FIFTY ISSUES Rick and Morty! Join us as we celebrate this milestone with a special, super oversized MORTY'S MINDBLOWER issue! Featuring creators from the previous 49 issues including Kyle Starks, Mark Ellerby, Andrew Maclean, Tini Howard, Jarrett Williams, Sarah Graley, Josh Trujillo, Rii Abrego, Benjamin Dewey, and Sarah Stern." The fourth season of the Rick and Morty TV show is also in development, as the show was renewed by Cartoon Network for 70 more episodes. Co-creator Justin Roiland revealed the team was excited about the future in a previous interview. Rick and Morty #50 hits comic stores on May 29th.